Seminole-pieced "vines" and contrasting fabrics create a distinctive pattern in this striking table runner. Size: Runner: 16" x 48". Block: 8" x 8". Membership is FREE, and easy. There's no obligation of any kind. Learn more about Quilter's World email updates and many others. Make quilting fun and easy! Get loads of creative patterns for dazzling quilts, quilt techniques that make it easy, profiles of interesting quilters, great gift ideas and more! And you're sure to love the easy-to-understand instructions and full-color photos. YES! 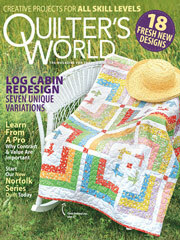 Please send me my FREE ISSUE of Quilter's World magazine and start my subscription. If I like my free issue, I'll simply pay the attached invoice and get one full year (4 more issues) for only $21.97 plus $2.98 delivery. That's one issue FREE and four more as part of my subscription! I'll also get a digital edition of each issue at no extra cost, including the free issue, plus two years of digital back issues with my paid subscription! In the unlikely event that I'm not pleased with my free issue, I'll return the invoice marked "cancel" and keep that issue as your gift to me -- and owe absolutely nothing. Don't miss out! Get email alerts about your new magazine subscription, special offers and savings from Quilter's World and Annie's. Questions? Read our online privacy pledge. Introductory offer for first-time subscribers only. Orders subject to approval. Offer valid in US only.